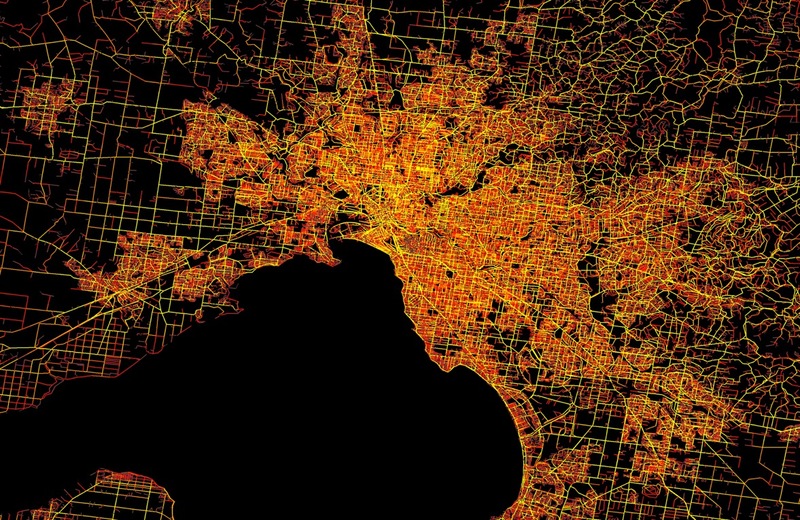 Researchers at The University of Melbourne are active in dozens of projects exploring the spatial component of data. Covering spatial data acquisition and sensing, data management, analysis, visualization and communication, and decision making, we are actively contributing to the spatial sciences from theory to applications. This project aims to employ Geographical Information Technologies to develop a pilot version of the digital mapping system “Museum Soft Power Map”. 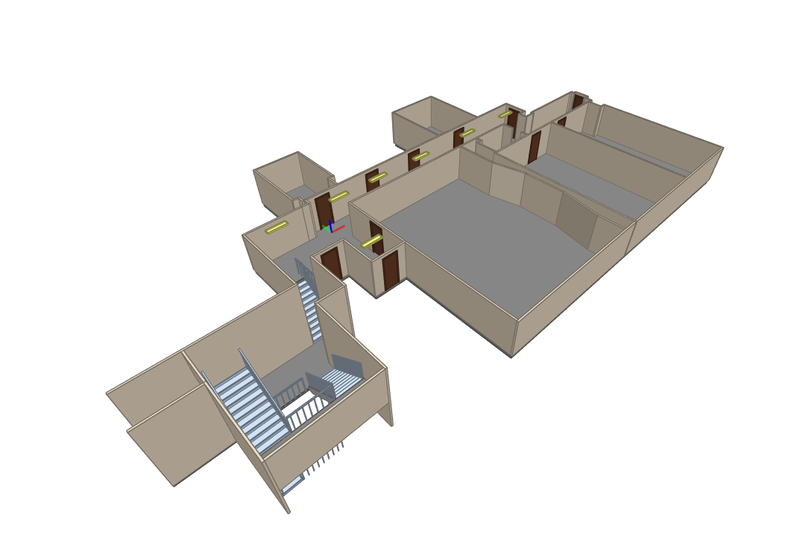 This digital system will provide a new computation research method to explore contemporary museums and geography of their influence. It will geo-visualise museum “soft power,” defined as an institutional ability to mobilise global public, generate economic activity and attract international investments. The project brings together academics and 6 graduate students from the School of Culture and Communication at the University of Melbourne to collaborate with cultural professionals from the Australian Centre for the Moving Image (ACMI). It aims to trial a pilot version of the digital geo-visualisation system “Museum Soft Power Map” that will be fully developed based on the project’s results and findings. The pilot is a focused single-museum online tool to map and assess the ACMI’s “attraction power” in Melbourne and abroad. The Project received the 2018 Melbourne Engagement Grant, 2018 Award of the International Alliance of Digital Humanities Organizations and 2017 Museum Computer Network Award, granted for developing innovative solutions to enhance museum transparency and strengthen proactive management in global PR. This research makes a significant contribution to the study of contemporary museums and facilitates a more nuanced contextual exploration of their impacts that can supply data for a more complex city-wide cultural research and planning. This ARC-funded project (2017-2019) aims to deliver the fundamental computational methods to capture, model, process, and interact on human place knowledge: knowledge about places and their relations, instead of coordinates and maps. These novel methods will enable smart human-machine interaction that intuitively is based on place knowledge. This project aims to develop methods for automated mapping of indoor environments and generating semantically rich 3D indoor models from point clouds. Such models will be used in path planning and navigation, emergency response and a range of location-based services. Internal funding from Melbourne School of Engineering. Future transportation services are emerging with the introduction of new IT capabilities. Among these, ride-sharing is conceived as an appealing alternative to public and private transportation since it combines the advantages of both. Although ride-sharing companies have millions of users around the world, many of them do not offer true ride-sharing services. They instead offer services similar to taxi companies. There are also aspects like convenience, trust and incentives which have not been addressed properly. This research proposes to enhance the ride-sharing model by creating algorithms that match participants not only based on their shared routes but primarily on their destinations. The research shows that users will find this ride-sharing model more convenient and with more incentives. This project aims to deliver techniques and methods to capture, model and process knowledge of local drivers in a location-based social network. Recently many navigation services have started to collect traffic data from drivers to enhance their services. The focus of their efforts are on real-time estimation of traffic conditions to offer better navigation services and help people avoid traffic incidents. However, using drivers as mere traffic sensors and aggregating their data disposes off any human knowledge and judgement that exists in their choices. Commuters in a city have a valuable knowledge about their city traffic patterns as a result of their daily commute over many years. In this work, the researchers have taken a different approach to navigation advice, and used individual driver trajectories to deduce travel choices. The goal is to help drivers avoid traffic events by providing routes that bypassed congested routes during similar events in the past. 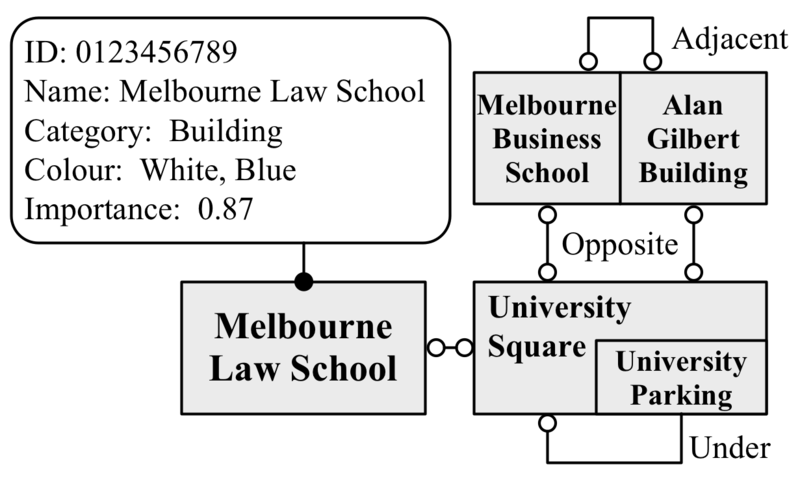 A solution that combines graph search and trajectory search to find the fastest path taken the past using historical trajectories under similar conditions in a city is used. A knowledge base is a collection of interconnected factual information. It has been used in popular search engines such as Google to answer queries that require reasoning through the connections between facts. However, there is a lack of a global-scale knowledge base in the geography domain. The aim of this project is to develop the foundations and algorithms for constructing and querying a knowledge base that contains geographic (spatial) entities in a global scale and local (building) level. It will make locating addresses much easier and improve the user experience or enhance the functionalities of vehicle navigation systems, tourism, and geographic information systems. 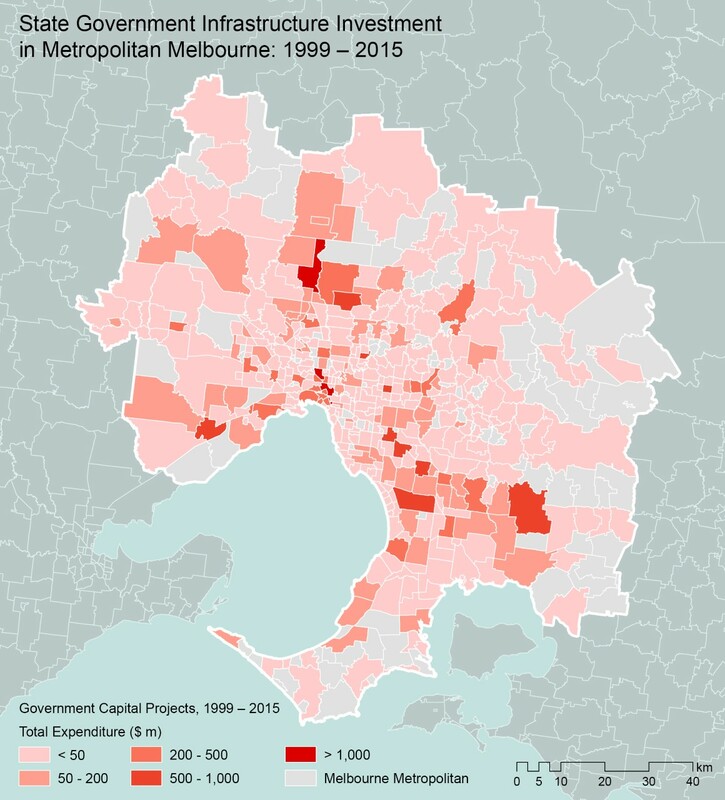 This component of an ARC-funded project (2014-2017) used GIS to map the spatial distribution of state government capital expenditure on infrastructure and services in Metropolitan Sydney and Melbourne over three decades. The analysis identifies sustained inequalities in the patterns of distribution of these critical social and economic resources. For further information about the project please contact Ilan Wiesel. This MNSI-funded pilot project uses large-scale geotagged tweets in order to assess the influence of greenspace on the mood of urban dwellers. The conducted sentiment analysis relies on recent deep learning techniques developed to effectively extract rich lexical meanings from tweets and to find abstract representations for their associated sentiment. This approach enables us to understand the role of greenspace in influencing peoples’ wellbeing. For further information about the project please contact Stephan Winter. This project will deliver a world-first computational framework for self-healing maps. It will be the first application of autonomous artificial immune systems to map data, enabling continuous assurance of map quality. This project will develop methods for autonomous preservation of map data consistency based on heterogeneous data inputs, such as from autonomous sensors. It aims at improving the trust in maps in time critical decision-making, such as in emergency response and traffic management. This project develops innovative statistical and modelling approaches to augment existing surveillance data gathered to assess the impact of treatments with demonstrated efficacy against liver cancer and death, using recent methodological advances in spatio-temporal statistical models accounting for effects of mobility and demographic structure. The project develops digital applications for the collection of data on household and community connectedness and mobility in remote Indigenous communities. There is a set of conventional wisdom around the rules of buying property. The worst house on the best street. Buy in a blue-chip school district. High risk equals high return. 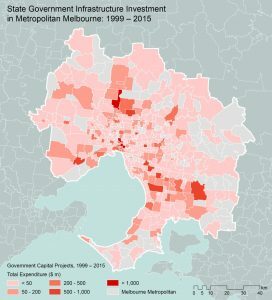 In an overheated Melbourne property market can buyers ensure the safety of their investment? Our recent analysis of property sales and rental returns arms investors with information about the potential differences in investment returns based on location, property size and structure type – a house or a unit. For more information about this project see the project’s website. This project evaluates the impact of short term rentals on the housing and rental market. For more information see the project report. 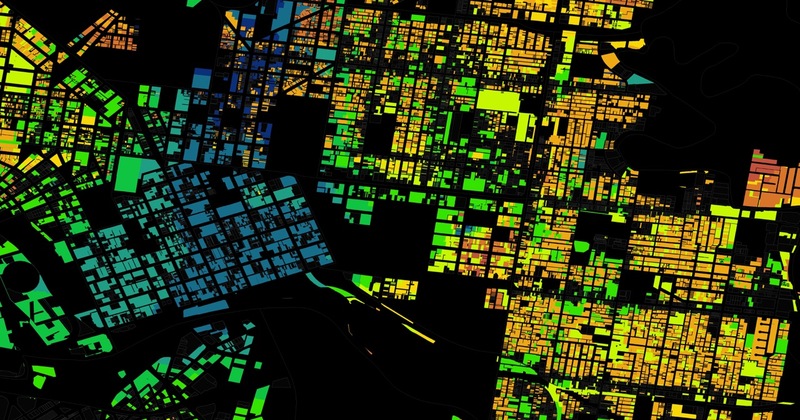 This project evaluates the street network of Australia to identify centrality measures that correlate with traffic, property values and health outcomes. This research uses neural networks to classify areas where walking is more prevalent than other modes of transportation. A multi-layer convolutional neural network is trained with with images, maps and trip data to distinguish different urban morphologies’ impact on the choice of transportation. Guiding governmental investments to areas with high potential for sustainable development by using geospatial information. For more information see here. 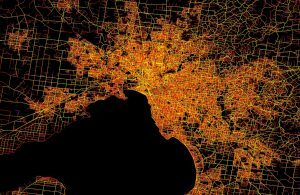 This project investigates the applicability of large-scale tracking data to improve disease spread modelling in a metropolitan population at a fine-grained spatio-temporal resolution. This project explores the correspondence between the Web and physical behaviour of indoor mall visitors.